Lactose is a disaccharide (2 sugars) made up of glucose and galactose (which are both monosaccharides). Because of the anomeric carbon on the right side of the structure below, lactose can exist as two isomers, alpha, as shown, or beta, in which the hydroxyl on the anomeric carbon would point up on the ring structure shown below. It comprises 4.8 to 5.2% of milk, 52% of milk SNF, and 70% of whey solids. It is not as sweet as sucrose. 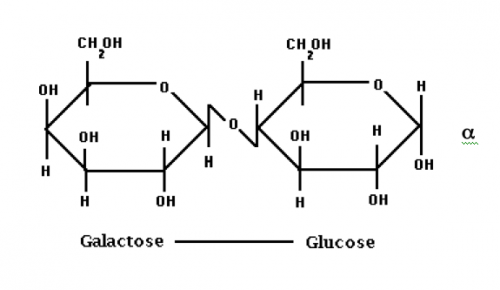 When lactose is hydrolyzed by ß -D-galactosidase (lactase), an enzyme that splits these monosaccharides, the result is increased sweetness, and depressed freezing point. One of its most important functions is its utilization as a fermentation substrate. Lactic acid bacteria produce lactic acid from lactose, which is the beginning of many fermented dairy products. Because of their ability to metabolize lactose, they have a competitive advantage over many pathogenic and spoilage organisms. Some people suffer from lactose intolerance; they lack the lactase enzyme, hence they cannot digest lactose, or dairy products containing lactose. 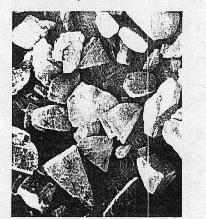 The picture shown on the left of alpha-lactose crystals shows the typical "tomahawk" morphology of lactose crystals when they form in dairy products. Lactose crystallization results in the defect called sandiness, due to the presence of these sharp crystals on the tongue. Lactose is relatively insoluble, which is a problem in many dairy products, especially ice cream and sweetened condensed milk. In addition to lactose, fresh milk contains other carbohydrates in small amounts, including glucose, galactose, and oligosaccharides.